Are you as sick of hearing that these two are “basically alike” as Clinton is sick of hearing about her fossil fuel money? Read on for why this argument is classically weak, misleading, and faulty. I thought this was a near perfect example of the quality of argument I see so often by Clinton supporters to (or against) Sanders supporters—a textbook case of the type of feeble, baseless, and illogical proclamations that get circulated. Like so many of these non-arguments, this one is a hodgepodge of conflation, omission, and diversion. It sets up a false equation and leaves out….everything else relevant. I’m never sure if it’s purposeful/conscious or just dim, but either way it’s myopic nonsense that sweeps aside all the surrounding facts as if they do not exist. In this case, the groundless hodgepodge is being used to say, “golly gee whiz, why on earth are progressives so hard on Clinton?” What kind of unreasoned, specious rationale, they project (projection is big with Clintons too) would anyone have for supporting Sanders and rejecting Clinton? While some might eagerly go “Yeah! Word!” in response to something like this and feel smug, anyone with an ounce of capacity for critical thinking can systematically explain why this makes no sense. This time, instead of just rolling my eyes, thought I’d do just that. Let me dissect for you in three parts just why this is a standard non-argument—and why this type of false-positive flawed argument drives us nuts. PART ONE: Let’s dispense with this one quickly: the “poor Hillary, she’s given such a hard time for no reason” implication. Laughable. She’s been given a hard time? Please. She’s had every advantage since well before this election started—money, media lockdown and lapdog-crafted narratives, name recognition, a 400-superdelegate head start, a Southern head start, voter suppression in Arizona and New York … Gosh, ever since the New York exit polls had margins of error in excess of 14% on the Dem side only, where such rare margins had previously always triggered investigations of fraud, the networks (who pay for exit polling) for the first time ever simply cancelled all the polling for the rest of the races. Poor Hillary. She says the same things as Bernie, and he gets praise and she gets backlash. PART TWO: Except she doesn’t say the same things as Sanders. (Except when she is parroting him and pretending to, which admittedly she’s done a good bit of this year, in the tone-deafness and condescension of thinking that it’s as simple as “keywords and phrases” that “push our buttons” as opposed to actual embodiment, consistency and action. More to the point, though, she doesn’t intend the same things, specifically, as Sanders. The statement as given suggests that the two candidates both say the same thing AND mean the same thing. It presumes that the two share one simplistic position: “College should be affordable.” So (a) That’s the sum total of it all. And (b) it’s identical. They say/mean/intend the same thing, says this post—and yet don’t get the same response. So inexplicable! So unfair! This is inaccurate because it is both utterly incomplete and worthlessly general. 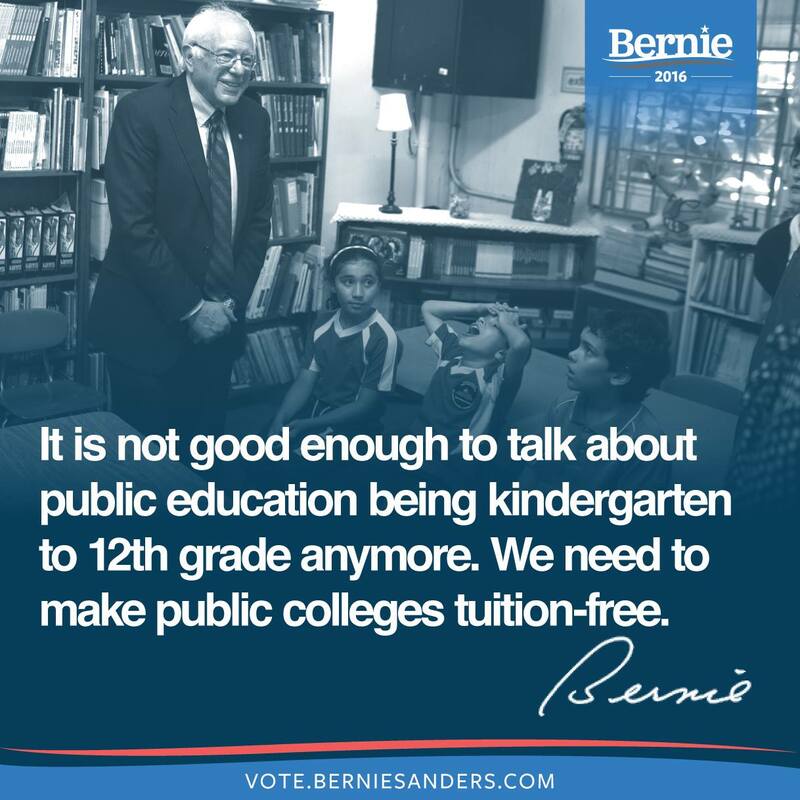 There is far more to it than “I think college should be affordable.” That generic statement is a sleazy straw man. That’s not all that Sanders says, and that’s not all that he will DO. She may say that. Something like that. Sometimes. But she has no plans to do anything about it. He doesn’t just say “college should be affordable.” He says he will make public colleges and universities tuition-free. And pay for it, by the way, with a tax on Wall Street speculation and by requiring companies to pay their fair share of taxes instead of squirreling their money away offshore. And the thing is, it goes that like down the line, on just about everything, from gargantuan monolithic issues like healthcare, Wall Street, fossil fuels and climate action, campaign finance, and foreign policy stances (Iraq, Afghanistan, Iran, Syria, Libya, Israel, Palestine, etc. )…to a bevy of other less front-and-center but still-important issues from minimum wage to private prisons to GMOs to fracking to immigration. So, how convenient and Tweety and cherry-picking to stack up this vague statement as “proof” that they are “the same”—which apparently should leave us to puzzle over why Clinton “gets the short end of the stick” and scratch our heads about why she would be considered establishment. PART THREE: Which leads to the third error in this nonsensical, poorly constructed premise: it doesn’t address all the OTHER reasons there is a backlash against Hillary Clinton, or that she is absolutely the poster child for political establishment. It not only imagines that this one supposedly identical position (so bland as to not even qualify as a position) equals “sameness” (and therefore “unfairness” if one does not love and support Clinton). It also it conveniently ignores the reality of there being, like, 150+ other reasons people don’t support Clinton. The extent of the “thinking” is: Because they have the same position on this one thing (which they actually don’t), they should be loved the same, treated the same, supported the same. A statistics OR philosophy professor would laugh this thesis out of the galaxy. But people who want to believe what they want to believe seem to eat it up. The thing is, even IF their positions—and plans!—re college were identical…that wouldn’t absolve the other ten or fifteen dozen differences and issues. Well, we don’t recognize it because it’s a wishful fiction. Believe me, if Clinton actually were a decent and reasonable candidate, anything like Sanders at all, a lot of us would be very happy and resting a lot easier. Believe it or not, we’re not sticking so hard with Sanders just to be stubborn or recalcitrant or righteous. We have substantive reasons for being disgusted by Clinton and/or uplifted by Sanders. There’s not a reason in the world we would call a wonderful candidate a lousy one just for the heck. Or invent differences where there are none. Why it is so hard for Clintonites to get that this person doesn’t represent us in the least? Based on dozens and dozens of actual positions, actions, behavior, motives? It’s a study in cognitive dissonance that universities could be case-teaching in Psych 101 for decades to come. Just to put some meat on the bones of this point, here is a partial list of those substantive differences that actually explain the so-called “backlash” and support our sense that Clinton is indeed an “establishment puppet” (hey, they said it), and not our candidate or the right candidate. They ought to shatter the sheer fantasy that these two are anything alike. One is a social democrat; one is a neoliberal/neocon/oligarch. One voted or supported for nearly every free trade agreement (including NAFTA), one voted against them all. One voted for the Iraq war and later called it a business opportunity; one not only voted against the Iraq war, but spoke out vehemently (and as it turned out, presciently) against it when it was not politically expedient to do so. One shut down a Black Lives Matter activist at her fundraiser and had her removed; the other immediately stepped aside and gave his mic to an interrupting Black Lives Matter activist. One fought for gay rights vehemently his entire life; the other supported the Defense of Marriage Act doggedly and repeatedly until she began her Presidential bid, saying on camera many dozen times that she did not believe gay people should be allowed to marry. One wants to tax Wall street speculation; the other does not. One wants to ask the top 1% to pay their fair share of taxes; the other does not. One takes major money from big banks, fossil fuel companies, pharmaceutical companies, private prisons and biotech; the other does not. One has given millions of dollars worth of speeches ($21 million since 2013) to industries with which she has cozy relationships; the other has never done so. One is fiercely intent on election/campaign finance reform (ending Citizens United); the other says she is but has benefited enormously by it not happening. One supports a tax on carbon; the other does not. One supports fracking (and worked to spread it around the world); the other does not. One strongly supports Monsanto and biotech, gives highly paid speeches to their trade groups, and coaches them on how to sound more palatable; the other has been speaking out critically about these companies and their practices since the 90s, and supports GMO labeling. One supports legalization of marijuana; the other does not. One supports (and take money from) private prisons; the other does not and has plans to end mass incarceration in this country. One supports the death penalty; the other does not. One lied repeatedly about landing in Bosnia under sniper fire; the other has never done such a thing. One has repeatedly lied outright about her opponent (auto bailout, anyone? ); the other has not. One has lied repeatedly about many dozens of other things, caught on camera and easily verifiable; the other has a reputation for outstanding honesty. One has never been involved in a scandal in his life; one has been dogged by them. One has been consistent in his positions of 40-50 years; the other has flip-flopped and back-walked her way through her career saying anything and everything for political expediency. One has a foundation that is believed to exchange arms deals and other favors for contributions; the other does not. One is a multimillionaire and member of the ruling elite; one is not. One is across-the-board endorsed by veterans; the other is not. One feels beholden to the middle class; one is completely beholden to corporations. One criticized and predicted the outcome of the Panama Papers; the other is involved in them. One brags about being praised by Henry Kissinger; one loathes Henry Kissinger. One voted for the bankruptcy bill; one voted against it. One wants to reinstate Glass-Steagall; one does not. One has potentially breached national security with inept if not criminal email behavior; the other has not. One polls double digits ahead of Donald Trump; one polls more or less even with him (and was at Trump’s wedding besides). One is known for his stance on—and embodiment of—ethics, morality and principle; one is not. One is known for humility and near-nonexistent ego; the other is most definitely not. One is adored by corporate America; one is loathed by them. One is loved by millions of people and has the only positive favorability ratings in the race; one is dogged by trustworthiness and likeability issues and always has been. One wants to be President to create real change and help working class people; the other wants to be President because she wants to be President, and to protect the elite ruling class. One is leading a movement and a political revolution galvanizing a huge and diverse base of passionate people; the other is waging a campaign for her own purposes. One is about US; one is about HER. Many of these are indeed facts. Some are certainly observations, feelings or opinions—but ones that are shared so consistently by millions of people that one must at least consider their basis. If I asked friends and colleagues, I could probably double this list. But I realize that I’m mostly probably either talking to the choir, or I’m talking to people who can look at a list like this and cry “But she’s a woman!” “It’s her turn!” or “Republican swiftboating!” and turn their backs resolutely. When actually that argument has to be either obtuse or strategic. If you’re really all like, “Yeah! everyone picks on Hillary when she’s the same and she says the same stuff as Bernie!” consider these very real issues. If you want to argue, come out with a basic ground of rationality. We need to agree that water is wet to have an conversation. The construction of a “problem” like the above leaves us in flat-earth land. 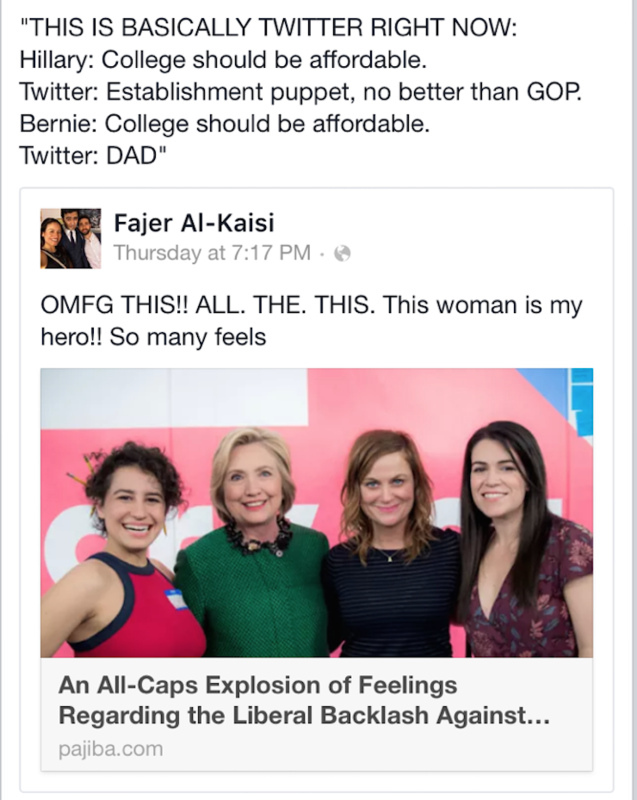 And ONE LAST THING about this little Twitter share: The fact that a particular bunch of celebrities say I’m with her? Of course many of them want to be associated with the Clinton name. Of course that world makes sense to them. They are fellow cronies. They are fellow ruling elite, one-tenth-of-a-percent, “masters of mankind.” Celebrities are insiders. Those celebrities who’ve come out for Sanders, because they do care about other people and the world beyond their Hollywood glitter bubbles—like Susan Sarandon, Mark Ruffalo, and Rosario Dawson—well, #I’mWithThem. I think they’re more rare, but I’m grateful they’ve decided to use their money and influence for people outside their milieu. The ones offering half a mil per plate to sit at their table for Hillary? Their opinions mean nothing to me. The planet is at stake. I’m not impressed that a very rich person who stars in movies and has several 20,000-square-foot homes thinks another very rich person should be president. If you make $15-50 million a movie and your aim is to protect your own money and power, do I care about you? Do you care about me or the planet? Apparently not. One slice of America seem to be about just this phenomenon: people who worship that kind of fame and money, who are starry-eyed about those people. We’ll see you in Philadelphia. 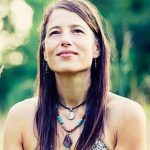 Robyn Landis is a writer, the author of two bestselling health books, blogger, fitness trainer and award-winning songwriter who is passionate about the environment and social justice. Find her at www.robynlandis.net and www.robynlandis.com, and on Twitter @cagefreechick. She is a NYC native, a longtime Seattleite, and now lives in Tucson, AZ.